How do I know if my baby has hearing loss? Most babies are born being able to hear. But up to 3 in 1,000 babies in the U.S. are born with some kind of hearing loss each year. Hearing loss is when you can’t hear sound in one or both ears. It can range from mild to profound. Profound hearing loss is when you can only hear very loud sounds, or you can’t hear anything at all. Hearing loss is a common birth defect. Birth defects are health conditions that are present at birth. They change the shape or function of one or more parts of the body. Birth defects can cause problems in overall health, how the body develops, or how the body works. One way to know if your baby has hearing loss is through newborn screening. The Centers for Disease Control and Prevention (CDC) recommends that all babies get screened for hearing loss before they’re 1 month old. Most babies get their hearing checked as part of newborn screening before they leave the hospital. Newborn screening checks for serious but rare and mostly treatable health conditions at birth. It includes blood, hearing and heart screening. If your baby doesn’t pass her newborn hearing screening, it doesn’t always mean she has hearing loss. She may just need to be screened again. If your baby doesn’t pass a second time, it’s very important that she gets a full hearing test as soon as possible and before she’s 3 months old. This can help her providers diagnose hearing loss early. What are signs of hearing loss? If your baby shows signs of hearing loss at any time, call his provider to get your baby’s hearing checked. Without early treatment, babies and children with hearing loss may have trouble communicating. They may have trouble understanding things that other people say, learning new words and saying words the right way. Early treatment can help babies and children with hearing loss develop speech, language and social skills. Every state has an Early Hearing Detection and Intervention (EHDI) program that works to help children with hearing loss and their families. It can help with hearing tests and other services for your baby. Find your local EHDI program through the National Center for Hearing Assessment and Management website. 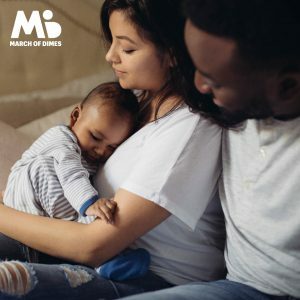 To learn more about hearing loss, visit marchofdimes.org. My NICU Baby App™ is available in Spanish!